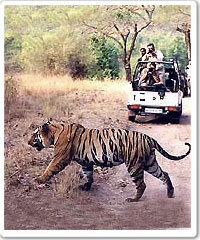 Royal Wheels India is an adventure travel group organising Bandhavgarh National Park Tour Package in India. 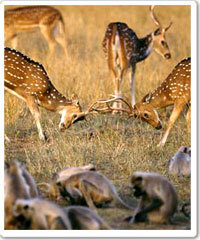 Bandhavgarh lies in the heart of Madhya Pradesh- traditional tiger country. This is where Rudyard Kipling found inspiration for his famous Jungle Book (remember Mowgli? ), and this is where the tiger still roams- although now protected by dozens of laws, some effective, some not. Once the hunting preserve of the Maharajas of Rewa, where an alarming number of tigers were hunted down in pre-independence India, Bandhavgarh was mercifully declared a National Park in 1968. 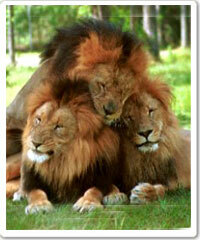 Today, the Bandhavgarh National Park is a compact reserve (448 sq. km) of sal trees, bamboo thickets and grasslands, teeming with birds. dhobin and saga and large stretches of grasslands with bamboo groves. Dominated by a large fort said to have been built by Lord Rama the hero of the Indian epic Ramayana, Bandhavgarh is famous for its tigers. and animals and the highest population of tigers anywhere in India. The park is now home to 22 species of wildlife, including the regal 'gaur', umpteen varieties of deer, and carnivores such as the striped hyena, jungle cat and sloth bear and over 250 species of birds. Within the park itself is the Bandhavgarh Fort, now in ruins and largely overrun by the surrounding forest. Although Bandhavgarh is in the area where the famous white tigers of Rewa were first found, don't expect to see any of the exotic beauties around. What you will see, however, is an amazing diversity of flora and fauna which can certainly make a trip to this wildlife preserve utterly worthwhile. All visitors to Bandhavgarh need a permit to enter the wildlife national park; this can be obtained at the entrance to the park. Entry fees for foreigners are Rs 200; for Indians and members of SAARC countries, Rs 20. Additional charges are levied for the entry of vehicles, for cameras and for elephant rides. If you're looking to sight the majestic tiger in his natural habitat, head for Jabalpur by jeep, bus, plane or train and from there onwards to the Bandhavgarh National Park, 165 km northeast. The nearest airports are in Khajuraho (210 km away) and Jabalpur. Buses from Khajuraho to Bandhavgarh do the trip in about five hours. The closest railhead is the town of Umaria, which is 30 km from Bandhavgarh; it's linked by train to cities in Madhya Pradesh and other states, including Delhi. Private and state owned bus Services operate regular buses to Bandhavgarh from Umaria, Jabalpur, and other towns in Madhya Pradesh. Taxis too can be hired to get to Bandhavgarh. The wildlife park's entrance is at a tiny settlement called Tala, which has facilities- although limited- for accommodation. Within the bounds of the Bandhavgarh National Park, vehicles may be hired at the entrance to drive around; in addition, private vehicles are allowed in. You could also ride through the jungle on elephant-back -- and if you kept completely quiet and are very, very lucky, you could even spot a tiger! Like many of India's other wildlife preserves, national parks and sanctuaries, Bandhavgarh National Park too closes for visitors during the monsoon months, July to October. Between November and June is the best- and only-time to visit the park. Besides this, there are hotels and forest lodges at Tala (at the entrance to Bandhavgarh). Day 01: Depart by train from Delhi to Umaria (travel in air conditioned second class sleeper). Spend overnight on the train. Day 02-06: Early morning arrive Umaria station (06.00 hrs approx). Transfer to Bandhavgarh National Park (30 minutes driving time approx.) at your resort for five nights. Enjoy your morning and afternoon jeep-safaris and elephant-rides in the Bandhavgarh National Park. Spend overnight at the Resort. Day 07: Morning depart by surface to Jabalpur railway station (170 kms. - 05.00 hrs driving time approx.) to board your train at 15.40 hrs (travel in second class air conditioned sleeper) for Delhi. Overnight on board the train. Day 08: Arrive Delhi at 07.20hrs. Transfer to a hotel for day use. Later in the evening transfer to the International airport to connect your flight for your onward destination.